This cozy and charming cabin is approx 1,500 sq. ft. that has an open loft that can sleep 2 adults and 2 small children and 2 bedrooms that can sleep 4 with 2 bathrooms. The entire main living area, bathroom and middle bedroom has brand new wood flooring. There is satellite TV, wireless internet, microwave, dishwasher, oven, washer and dryer, forced air heating (but NO air conditioning), wood stove, mudroom/laundry room and outdoor deck with a gas grill. We have security cameras around the perimeter of the cabin, but are not inside the cabin. These cameras are reviewed by the property manager only if there was a complaint or an issue. 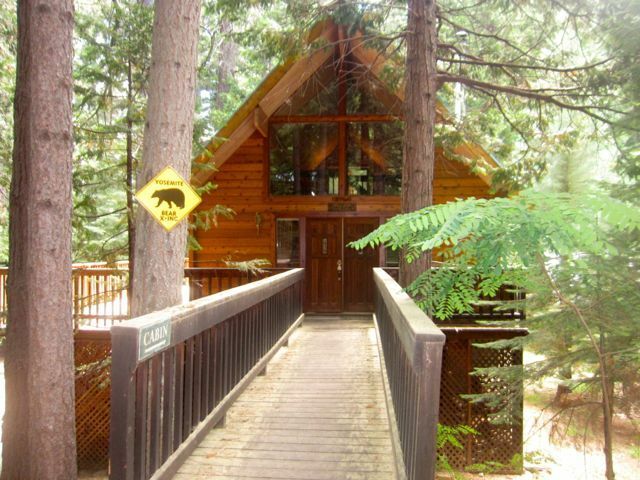 The cabin is walking distance to the Tenaya Lodge, which has restaurants, bar, bike rentals and horse carriage rides. It is a short 2 mile drive to the southern gate of Yosemite and Mariposa Grove. Bass Lake is just 13 miles away. There is also Horseback riding and the famous Sugar Pine Railroad within 2 miles. The community of Fish Camp is a location where parking can be difficult to find, but our cabin has off-street parking enough for 3 cars and a drive-thru driveway, which you will find to be very convenient. Our cabin is a non-smoking cabin, NO SMOKING EITHER IN THE CABIN OR ON THE DECK! Please respect this policy, we would appreciate that. Enjoy our cozy family cabin! We are a family of 4 living in Solvang, CA with Ken being a CPA and owning his own CPA firm and Ronna working in sales at Ingeborg's Chocolates. The cabin is co-owned with Ken's late father, Don, and his mother, Joan. Our son, Colby works in Santa Monica, CA and our daughter, Shane, goes to San Diego St. We have 3 dogs, Coco, Rico and Lulu. Ken has been going to Fish Camp for over 50 years since he was 4 years old. His family used to stay at a family friend's cabin, which just so happens to be next door to this cabin!! When the owner/builder of this cabin was ready to sell, they offered the cabin to Ken and his parents before it even went on the market, as they knew it would be taken care of and kept special. We have been coming to this cabin as a family since our kids were just 13 and 8 years old and it holds such special memories. Since Ken's dad passed away in August 2012, we decided to share these memories by renting the cabin to other families so they can enjoy the love that surrounds our cabin. This cabin feels like you just stepped out of a storybook. It is surrounded by large pine trees, yet it has all the comforts of home. Also includes a blender and a crockpot. This cozy cabin has a large open loft overlooking the family room that has two twin beds and a queen size bed that can sleep 4 comfortably in addition to it's 2 bedrooms and 2 bathrooms. There is an additional cleaning fee of $225. The $200 damage deposit could be fully refundable. We also have outside surveillance cameras for your protection and safety, the glow from the cameras at night are just the infrared lens, it does not mean you are being watched. The footage from the cameras are ONLY reviewed by the property manager if there is a complaint or an issue. Everything about our stay worked out great for the 5 of us. As other mentioned, the basement was a little bit cold but nothing to be overly concerned with. The cabin had everything we need to make meals. Location was close to the south entrance to Yosemite. A little bit of a drive to get the core of the park, but we knew that going in. Absolutely a beautiful and well stocked cabin that was impeccably clean. Our family of four stayed here for a fabulous 5 day get away from the stresses of life. As soon as we drove up to the cabin and then opened the front door, we immediately knew we made the right choice. The cabin is so beautifully decorated, has very comfy furniture, the kitchen had all the comforts of home, laundry area very convenient, beds VERY comfortable, and the ENTIRE cabin spotless! Coming back to the cabin after a long day hiking or touring Yosemite NP was so comforting. We started a fire in the wood burning stove every evening which was such a fun thing for us. The location was FABULOUS for visiting Yosemite. It literally took 10" max to drive to the south entrance. I can't say enough good things about this cabin. The owners were VERY responsive to all our questions before we arrived. We honestly never had to even contact them once we arrived because we had ZERO questions/problems. We received our deposit back within 7 days. Yosemite and this cabin made for the best family vacation we have ever had. Definitely hoping to return to Yosemite and this cabin in the future. We had a wonderful stay! Our hosts were terrific, the location is amazing (close to Yosemite and beautiful in its own right). We spent our time sitting in front of the fire and playing in the snow. The kitchen had everything that we needed. Thanks for an amazing weekend! We had a wonderful getaway at the cabin. This was our second time staying here and hope to make it an annual trip as we are accumulating wonderful memories there! The cabin is cozy, clean and has a well appointed kitchen. We stayed with our new baby, and my husbands parents as well as our pups and it was perfect. The view of the trees through the high windows and the fireplace make for the perfect place to play games and enjoy a bottle of wine. We are so thankful this cabin is available to rent and are oooking forward to next year. Thank you! Be aware that this property is described as “cozy cabin.” It is indeed a pretty basic but clean cabin with very minimal supplies. If you are considering this property, be aware that to get to most beds there are very steep steps so this may not be a desirable property for those with young children or those with mobility issues or knee problems. The floors are also very slippery. The bedroom with the King bed is in the basement and in the winter it’s too cold to sleep down there. Also be aware that the government shutdown may mean that you cannot visit Yosemite National Park, which may limit your activities. Also be aware that while there’s plenty of toilet paper and bath towels, you will want to bring soap (there was a small container of dish washing soap but no other soap, including soap for washing hands in the bathrooms). You should bring shampoo and perhaps some dish towels (there were only three dish towels). I would also bring a clean sponge for washing dishes as the ones provided were very worn (and probably very germ-y). If you want to use the wood stove, you might want to bring a lighter and kindling, as these were unavailable. However, we did find the manager/owner to be responsive, which was helpful. I have stayed in many VRBOs and felt this one was overpriced but if you had enough people in it, it might be a good value, though quarters might be tight. Very Cozy and spacious at the same time! Beautiful place. Truely a feeling of a home away from home. Well kept in every sense. Everything provided from kitchen ware to all other amenities. All you need to bring is your clothes and food. Our family had a great time! Only thing we would ask more of is to stay longer. The cabin itself is truely impeccable. Thank you for everything. Our family hopes to stay here again in the future. Side note: the employees at the general store right around the corner are super nice and helpful and answered some questions we had about finding a good place to find snow or any other questions you may have!